As sports become more popular, so are the competitive demands. Players feel pressure to do extra one-on-one work outside of practice, and by the time they get to practice…they’re beat. Recently, Eric Gundred, who is the TOSH State Select coach and Utah Storm Director of Coaching, introduced me to the “Hair in the Oatmeal” concept, which was spot on. Here’s how it goes: A player comes to practice with their head down (“hair in the oatmeal”), low energy, unmotivated, grumpy, tired…etc. We’ve all seen it, and possibly felt it. Often, overtraining and overuse injuries happen simultaneously, but there are differences. 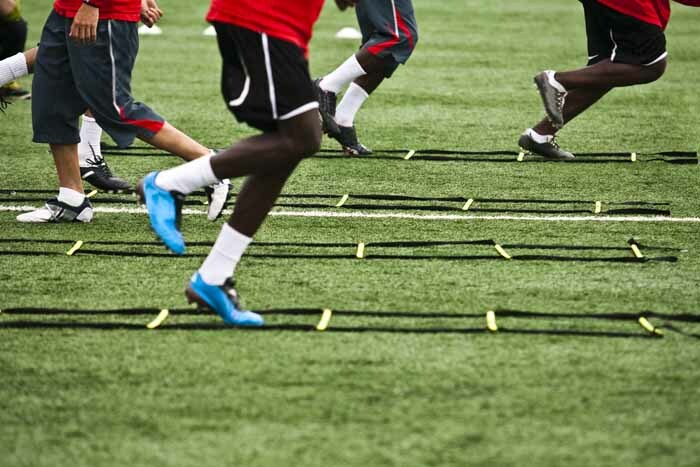 Overtraining is the cause of either overuse injuries (physiological) or burnout (psychological) in players. Overtraining stems from increasing physical activity too rapidly, too many practices and games without adequate recovery time, over-committed athletes who participate in multiple sports or teams at the same time and so on. According to the American Academy of Pediatrics, approximately 50 percent of all pediatric injuries are related to overtraining. Overuse injuries occur from repetitive micro-traumatic damage and stress to bone, muscle and tendons without adequate time to heal and repair. Common overuse injuries are shin splints, patellar tendonitis, achilles tendonitis, chronic quad and hamstring strains, chronic low back pain, and reoccurring hip flexor strains. Pediatric overuse is more serious because of growing bone anatomy as well as soft tissue. 1. Treat practices and games the same. To play well in a game, athletes are certain to eat well, complete their entire warm-up, stretch properly, and ice afterward, when they feel the need. For practices, athletes might not come fueled properly, go through the motions during their warm-up, get lazy during drills, etc. That’s when injuries occur. They grab their bag and head for home to do their homework and eat whatever they can find. They’ve ignored their body and the maintenance required to recover for the next game or practice. 2. Acknowledge the stages of an overuse injury. 2) Pain during activity without restricting performance. 3) Pain during activity that restricts performance. 4) Chronic pain even at rest. 3. Recognize the signs of overtraining early. As a coach or a parent, you can tell when your athlete isn’t feeling and performing to their potential. Pay close attention to changes in their gait, movement patterns, attitude and energy level, and modify their practice demands when you notice changes. Recognize that all athletes work through injuries of some kind at some point in their life. Some athletes are so afraid to bring up aches and pains because they don’t want to show they’re weak or appear like they’re looking for a way out of hard work. Build them up and recognize, along https://intermountainhealthcare.org/locations/the-orthopedic-specialty-hospital/medical-services/sports-medicine-and-performance/with your athlete, that the sooner we take care of an injury, the sooner they’ll be back playing at their full potential. 4. Modify practices to unload the stressors. Soccer, for example, requires a combination of speed and endurance, as well as technical skill. An option presented by Larry Monson, director of physical therapy at TOSH, is to have soccer athletes do their conditioning in their running shoes or cross-training shoes. Soccer shoes have minimal cushion to unload the repetitive impact that can cause shin splints and lead to various stress injuries. Ask your athletes to bring additional shoes for those purposes. Other modifications that can unload impact and stressors is to focus on hip and core strengthening exercises during your practices and cross-training with another sport. Soccer players’ bodies — and their brains — need a break! What is the goal of each athlete? Ask them. Some might say they’re playing the sport to be competitive and hopefully make it to the next level; others may want to develop or improve a skill. Most want to build friendships with teammates or instill healthy behaviors, etc. Whatever their goal is, let’s help them get there! Please let me know if you have any questions or if we can help your athletes in any way at TOSH.